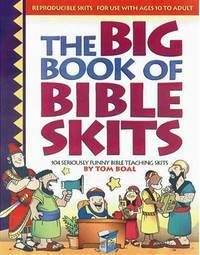 From The Big Book Of Bible Skits to The Really Big Book Of Cool Crafts For Kids, from	Big Book Of Bible Lessons For Crafty Kids to The Big Book Of Read-Aloud Stories #2, we can help you find the sunday school books you are looking for. As the world's largest independent marketplace for new, used and rare books, you always get the best in service and value when you buy from Biblio.com, and all of your purchases are backed by our return guarantee. Creation House. Good with no dust jacket. 1976. Paperback. 0884191184 . 1 x 9 x 6.4 Inches; 400 pages . Abingdon Press. Good with no dust jacket. 1982. Paperback. 0687399890 . Journeys in Faith; 0.4 x 7.7 x 5 Inches; 128 pages . Regal. Good; Nice shape. 2001. Paperback. 0830728740 . 6.9 X 4.2 X 0.6 inches; 192 pages .